Picture yourself in a boat on a river...the trees might be pine and the skies are blue, not marmalade, but a day spent exploring the Chattahoochee River National Recreation Area is a dream worthy of escaping into any day. Established in 1978 by President Jimmy Carter, the Chattahoochee River National Recreation Area (CRNRA) preserves a series of sites between Atlanta and Lake Sidney Lanier, along a 48-mile stretch of the Chattahoochee River. 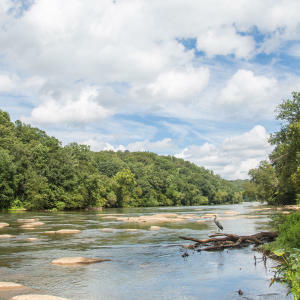 Three CRNRA trail units (Powers Island, East Palisades and Island Ford) and 22 miles of Chattahoochee River shoreline are located in Sandy Springs, providing endless opportunities for picnicking, fishing, hiking and wildlife-viewing all year-round. With Nantahala Outdoor Center operating two rental outposts within the CRNRA from May to September, it has become even easier to kayak, paddleboard and float on the ‘Hooch. Ready to get out on the river? We&apos;ve come up with a guide to help you plan the perfect day on the Chattahoochee. One of the first pieces of land purchased for the CRNRA was Island Ford in Sandy Springs. The Island Ford Visitor Center and National Park Service headquarters are located in the historic Hewlett Lodge. The building was once home to noted jurist Samuel Hewlett. 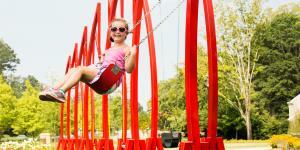 Find out where to enjoy a beautiful day in Sandy Springs. 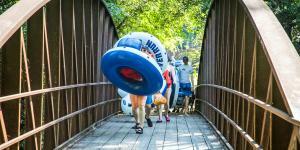 How To Plan The Perfect Day On The 'Hooch.